A storm is coming. Alpha Squad 5 is now recruiting commanders. Heed the call and take command of the Alpha Squad Super Soldiers in the action-packed fight against the evil Storm! Collect heroes and build the perfect squad of soldiers to take on all of Storm’s evil villains and minions. Join an alliance of friends online to work together and compete against others. 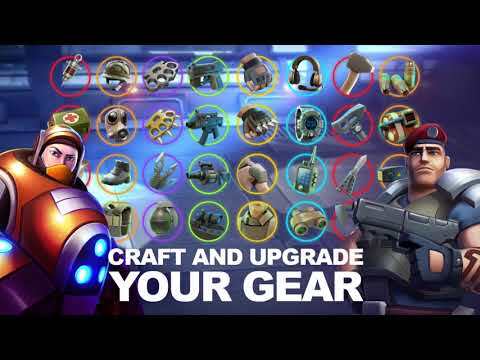 Thwart Storm’s plot to take over the world by collecting and upgrading your heroes equipment. Convince powerful villains to flip sides and join you in the fight! Alpha Squad 5 battles are addictive and fast-paced. With hundreds of quests, raids, PvP fights, real-time chat, and more, there’s never a dull moment. Start collecting your heroes and leveling up your squad today! Can you make it to the top of the global leaderboard?ALPHA SQUAD ASSEMBLE! Enjoy fast-paced battles as your heroes fight in real time through a beautifully rendered 3D world. It’s a unique world full of fun new characters to fall in love with and collect.Please note that Alpha Squad 5 is a free to play game, but some in-game items may be purchased for real money. You can disable in-app purchases in your device’s settings.Alpha Squad 5 requires an internet connection to play the game and enable social features, events, and other game features. Welcome to Alpha Squad, Commanders.